Terms and condition of rental can be seen in our 'ESSENTIAL NOTES' which we will send you along with our rental quotation. We do not collect your money and there is NO DEPOSIT TO PAY - Cruise America will collect directly from you ten weeks prior to pick up. NO DEPOSIT? All we ask for is that you provide us with your credit card details at the time of rental as a guarantee. Or tell us that you will pay by wire transfer. Once your credit card has been charged or your wire has been received at the appropriate date by Cruise America, we will issue your rental voucher showing everything you have prepaid and giving pick up and return details. You can get a Cruise America or Cruise Canada QUOTATION on line if you put in the city, dates and vehicle you require by clicking on the GET A QUOTE icon. Please be aware that prices are flexible and change weekly; the price of your rental may change if you don't BOOK before 3pm on Saturday of the same week as you got your quotation. This timing is very likely to change if you are booking close to your departure date. You can BOOK on line if you wish or send us a reservation request to reservations@cruiseamerica.co.uk. Is there a minimum amount of time that we have to rent? The minimum rental is 7 nights. There may be extended minimums over Holidays and during special events in which case the minimum may range from 7 to 14 nights per rental. Is there a maximum amount of time we are allowed to rent? No- however there are conditions attached to long-term rentals. You may, for instance, only rent for thirty days on any one contract. Each contract will be treated as a separate rental for pricing purposes. Is mileage included in the rental cost? Basic rental prices contain no mileage; you may pre-purchase additional miles in 500 mile/800 kilometers blocks. If you go over the prepaid mileage, on vehicle return you will pay 35 US cents plus tax per mile in the USA, or 35 C cents plus tax per kilometer in Canada for any extra miles/kms driven. There are NO REFUNDS for unused pre-paid miles. If preferred you can purchase Unlimited Mileage for a fixed fee for up to 21 days, followed by a daily charge. There are often discounts on unlimited mileage on specific vehicles at certain time of year so that is worth looking out for. NOTHING! 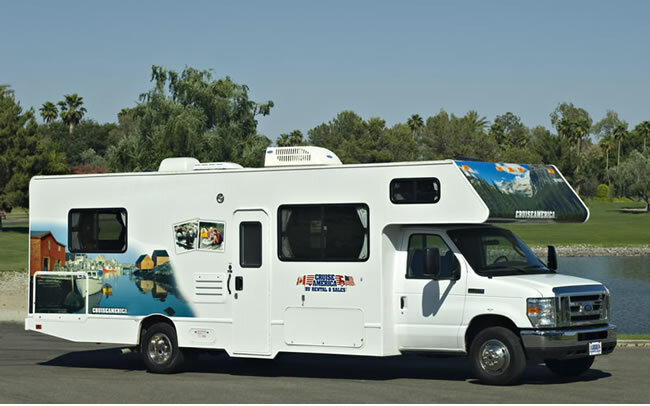 Cruise America/The Motorhome Experts do not require a BOOKING deposit at the time of reservation, but they do require that you leave your credit card details as a guarantee. Your card will be charged THE FULL AMOUNT DUE BY CRUISE AMERICA without further notice, on a date you will be given which is normally ten weeks prior to pick up date. If your reservation is made within ten weeks, your card will be charged by Cruise America immediately on confirmation of the booking. A REFUNDABLE SECURITY DEPOSIT of $500 will be required by the Cruise America pick up location at the time of vehicle departure. This is payable by credit card (which will be charged) on pick up day (if you don’t have a credit card for this charge, and prefer to pay in cash, this refundable deposit will rise to $1,000). On vehicle return day, any extra charges (such as extra per mile charges) will be balanced against the security deposit, and the remainder will be refunded. Is there a charge for generator use? Yes. If there is a generator fitted the charge for use is $3.50 per hour; there is a meter fitted. Remember, a generator is not necessary for normal vehicle operation. You can save on this expense by staying in locations that have electrical hookups and not leaving the generator running when you are not in the vehicle. If you wish you could pay $8 per day for unlimited generator use but unless you are staying 90% of the time in National Parks with no electrical hook-up, our experience shows it is better to pay by the hour. All you need is to be 21 years of age or older and possess a valid driver's license. No special endorsement is needed. When can I pick up a Cruise America motorhome? Cruise America rental offices are normally open Monday through Saturday from 9 am to 5 pm. The normal pick up time is between 1 pm and 4 pm and the normal return time is between 9 am and 11am. You must make your own way to and from the rental station. If you have booked an 'Early Bird Departure Special', and have pre-paid the appropriate supplement, you may pick up your vehicle before noon and return it by 3pm on the last day. In this unique case the rental company will include your transfer to and from the rental station. Rental Centers are closed on Sundays and Publlic Holidays. Our web site lists all of the types and sizes of vehicles we rent. Please go to our What's Available page. You can click between the four categories to see the sizes and specifications of each vehicle. I saw a picture of a motorhome with a garage in the back. Also motorhomes with a 'slide out' ? Do you rent those? Cruise America used to rent the 'Funmover' with the garage but no longer. Cruise America do not have slide-out vehicles though other suppliers we work with do provide them. Are Motorhomes difficult to hook up? Can you plug in an electric iron or a hair dryer? plug in your motorhome in just the same way! Can you fix a garden hose to the tap? Then you'll have no problem connecting your motorhome to mains water. But to be on the safe side, at departure you will be given a 30-60 minute familiarization tour of the vehicle and learn how to hook it up to mains water, electricity and, on occasion, waste disposal and how to operate appliances; you will also be shown an instruction video at most rental centres and you will always find a Renters Assitance Guide (RAG) in your vehicle. Does the motorhome come equipped with pots and pans and bedding? Cruise America rents two types of packages, one for bedding (PPK) and one for cookware (VDK): PPK costs $65 per person with tax, for the duration of the trip. It includes bedding, bath towel and wash cloth. VDK costs $111 per vehicle with tax, also for the duration of the trip. It includes things like a can opener, bottle opener, broom with dust pan, pail, spatula, cups, plates and cutlery for the party, serving spoon, serving fork, utility knife, platter, tea kettle, colander, mixing bowl, and a six piece cookware set. We can either include the cost of kits in your pre-payment or you can pay for them locally. See Essential Notes for full details of kit contents. WE INCLUDE TAX on everything you pre-pay but you will pay tax on any locally made charges. For instance, if you use it, the generator fee is $3.50 per hour plus tax and will be collected upon return of the vehicle. Extra mileage at 35 cents plus tax per mile or per km is also payable at the end of the rental. You may also be asked to pay fuel and cleaning deposits at the time of pick-up which will be returned at the end provided the vehicle is returned in good order. Does the motorhome come with a TV, VCR or stereo, toaster and coffee pot and can we rent a Sat Nav? There is an AM/FM radio in the dash. There is no TV or stereo or cable hook-up. Toasters and Coffee makers are not available and no, Cruise America do not rent Sat Navs. We feel that as these things are available at very low cost from stores like Walmart, it is best for you to buy what you need new rather than rent used goods. Are there rollout awnings on Cruise America motorhomes? No. We suggest you buy a sun shade umbrella at somewhere like Walmart if you need shade; or check with the RV park if you are staying in one. The T17 Truck Camper is available for up to three people; the C19 motorhome can hold a family up to 3, the C25 motorhome can hold a family up to 5 and the C30 can hold a family up to 7 maximum for travelling. Cruise America wants you to have an enjoyable and safe vacation experience - part of that experience is getting the right vehicle to meet your needs. Never exceed the maximum number of allowed passengers or your insurance will be void. All passengers must use the provided seatbelts. If you have a baby/child please be prepared to buy a baby/child seat as Cruise America do not provide them for safety reasons. Areas designed only for sleeping should not be occupied while the vehicle is in motion. Are there facilities close to the Cruise America rental centers where we can purchase supplies, propane and dispose of holding tank contents? We will always send you a location map with your rental voucher an this will normally show you where the nearest gas station and Walmart is. The staff at the rental centre will be glad to direct you to the closest shopping center, fueling facilities and waste treatment centre. Can we leave our luggage at the rental locations? Often this is not a problem, but space is sometimes restricted and it may not be an option. Anything left at the rental centre is at your own risk. We always recommend you take soft side luggage/barrel bag style/ruck-sack so they can stay with you and be easily stored in the motorhome. US registered RV's may enter Canada and return to the US and Canadian registered RV's may enter the US and return to Canada without problem. One way rentals between the two countries are not allowed. Be sure you have the correct visa or ESTA to enter the USA. Check www.visitusa.org.uk to find out how to get your ESTA. Are we allowed to take a Cruise America vehicle into Mexico? One-way rentals are available between most rental centres by advance reservation only and are subject to availability and some restrictions. One-way rentals can NOT be made on line and must be requested manually. Our very sincere recommendation if you want a one-way rental, is to book it as far in advance as possible - the previous July/August would not be too soon. There is NO DEPOSIT TO PAY (see above) but you stand a better chance of getting your one-way rental! Cruise America requires that the entire rental is paid before you travel, this to be done with a major credit/debit card – Amex, Visa, Mastercard. We will take the card details, and your mailing address, at the time of booking and Cruise America Inc will charge the card ten weeks prior to your pick up date. You may if you prefer, pay by wire transfer, in which case it is your responsibility to transfer the money so it arrives at Cruise America’s Arizona bank ten weeks prior to pick up date. If this is your chosen method of payment, please tell us and we will give you Cruise America's bank details. The ten week payment policy is very strict; please ensure your confirmation number is on your transfer document. There are no exceptions to payment date so please tell us when your transfer has been done. There is a section about campgrounds in our Essential Notes. Campground rates vary based on time of year, their location in relation to cities or major attractions, whether they are National/State Park or private campgrounds and what facilities they offer. They also vary according to the number of passengers in your motorhome. Generally you can expect to pay a base rate (two passengers) between $10 and $15 per night at a State or National Park facility and around $30-$35 per night for a regular private campground. Be aware that campgrounds close to major cities, near major attractions or in more isolated areas (ie Florida Keys) you may be looking at considerably more per night. Extra person rates are, on average, around $2 per night. Most Walmart's will allow you to cmp overnight in their car parks for free; great in an emergency but there are no water or electric hook ups. A partial list of commonly found facilities would include: electric, water, waste disposal hook-ups, washer, dryer, swimming pool, playground, BBQ pits, on-site convenience store. Do you plan itineraries for trips? Yes - quite uniquely we do. Most companies will prepare an itinerary for groups of motorhomes travelling together but we believe we are unique in providing this service for individuals. 99.9% of our customers take advantage of this pre-planning. Once your motorhome has been booked and confirmed back to you, we will create a mapped itinerary based either on your own rough outline of your aspirations or our own suggestion after your briefing about your personal likes and dislikes. We will also provide a list of suggested campgrounds along your route which we ask you to check for yourself on line to make sure they suit you. We do not book campgrounds. Is it possible to travel in the winter in the colder areas of the US? Yes, however, in locations with harsh winter weather, motorhomes are "winterised" from approximately November to March. This means water and holding tanks with anti-freeze. This will prevent the tanks and pipes from freezing and bursting. If you have any more questions on the rental policies during winter, please contact the rental centre where your trip would originate. They can provide you with specific information. ALASKA, YUKON, NORTHWEST TERRITORIES AND NEWFOUNDLAND Travel on all public and/or numbered roads is permitted. Travel on non-public roads, unpaved back roads, trails and the like — commonly called ‘logging roads’ — or on any surface subjecting the vehicle to unreasonable damage or road hazard is prohibited. Clients may receive further information from Cruise America regarding seasonal travel restrictions as well. We reserve the right to restrict travel, dependent on current road conditions. DEATH VALLEY Vehicles may be operated with EXTREME CARE in Death Valley and other desert areas during the months of July and August. In Summer, clients visit these areas at their own risk and Cruise America will not be held responsible for extraordinary vehicle recovery and other charges. During certain periods, these areas are not habitable and could pose a danger to the driver and passengers. MANHATTAN, NEW YORK CITY Due to restrictions on vehicle heights, propane gas and parking, vehicles with propane are not permitted in Manhattan and are not permitted to travel through any underground or underwater tunnels. MEXICO Clients are strictly forbidden to take Cruise America vehicles across the USA border to Mexico. No refunds will be made for early returns, late pick-ups or unused miles. The vehicle is overdue after 11:00 AM on the date of return; 3pm if you booked an Early Bird Departure special. A fee of $25 per hour, or the locally posted daily rate, will be charged. Please notify the rental centre if you will be late in returning. If you are late back you could be jeopardising another traveller's holiday. Cruise America and Cruise Canada do not supply baby or child seats. Please plan to buy your own car seats and cribs/cots - your babes will be more comfortable in a familiar seat/bed. This is not recommended. It is difficult to know if the water is potable when you fill the tank at a variety of locations. We recommend you use bottled water for drinking and cooking. The water from the tank is fine for washing and bathing. What kinds of coverage for damage and liability do you offer? You must notify Cruise America within 24 hours of an accident and make a full report in writing as well as file a police report - even if no injury was sustained. Cruise America provides 24-hour toll free travellers assistance line. All repairs in excess of $75 must have prior approval from our customer service department. The toll free number is 800-334-4110. We do not have ladders on the RV for safety reasons and to prevent damage to the motorhome. You are not permitted to climb on to the vehicles roof area. Not automatically fitted to the vehicle. Some locations have them subject to availability at your time of arrival for rent and we will request them if you ask us to or sometime the location staff can suggest a place to rent them. No. These should not be necessary. Your first night before rental must always be spent in an hotel and, unless you have booked the Cruise America Early Bird Departure, you must arrange your own transportation to and from your airport area hotel. We will often be able to give you some idea of taxi fares for your party so you can justify whether it might be sensible to book the Early Bird departure – which includes transfer to and from a designated area as well as allowing morning pick up and afternoon return. NB - Reservation "no-shows”: A client failing to arrive on departure day or a client who declines vehicle at departure is classified as a "departure day” cancellation.